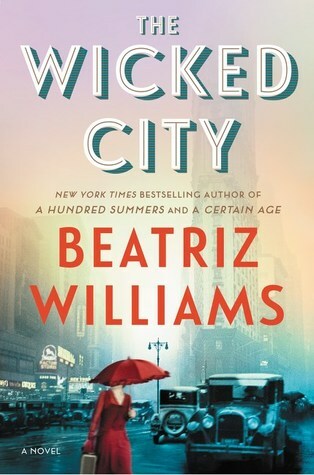 When I picked up my first Beatriz Williams book, I was completely engrossed and fell in love with her writing style. I wasn’t sure that I would like her books and wasn’t excited to read the first one, but I did and when I began, I was completely sucked in and impressed with her ability to tell a story. So from that point on, she earned a place in my heart as one of my favorite writers. When this latest book came across my desk for review, I was thrilled because I knew the caliber of writing and story telling would be second to none and I wasn’t disappointed in this one! When she discovers her husband cheating, Ella Hawthorne impulsively moves out of their SoHo loft and into a small apartment in an old Greenwich Village building. Her surprisingly attractive new neighbor, Hector, warns her to stay out of the basement at night. Tenants have reported strange noises after midnight—laughter, clinking glasses, jazz piano—even though the space has been empty for decades. Back in the Roaring Twenties, the place hid a speakeasy. Headstrong and independent, Gin is no weak-kneed fool. So how can she be falling in love with the taciturn, straight-arrow Revenue agent when she’s got Princeton boy Billy Marshall, the dashing son of society doyenne Theresa Marshall, begging to make an honest woman of her? The ‘jazz age’ or ‘prohibition era’ isn’t really my favorite era in American history. It’s not even in the top 5, but it’s a popular time period in historical fiction right now, so I’ve tried to embrace it over the last year or so. Even though I wasn’t ‘excited’ about a book set in this time period, I love Williams and had confidence that she would be able to create a lovable story for her readers. While I personally wasn’t a fan of the period, even in this book, it was the love story that made me love this novel. The mismatched love story between Gin and Oliver was charming believable, and memorable. The chemistry between them was electric and made me want to keep reading to see things heat up. I loved their story and I think it’s one that will hold readers interests. Williams tends to have two storylines in her novels…..the modern day story and the historical fiction story. While I think it worked in Along the Infinite Sea, I am not entirely convinced that this story needed the modern day parallel story. For me the relationship and story that shined was the Gin/Oliver story and Ella’s story seemed less drawn out and more of a filler. I personally was much more invested in the other plot and could have done without Ella’s plot. William’s hallmark style is a descriptive, whimsical, and elegant style with memorable characters and to that, this book doesn’t disappoint. Though a tad slow in the beginning, the overall pace of the novel picks up and readers will easily fall into the story after a couple of quick chapters. While this wasn’t a five star book for me, it was entertaining and a wonderful love story that offered the perfect escape for me. If you haven’t discovered Beatriz Williams yet, you are missing out. This is just another book that cements my initial reaction to her writing……her books are wonderful and will not disappoint! I’ve only read A Hundred Summers but I loved it so much it made my top reads of 2016 list so I’ve already got this one on my TBR. I can’t resist a good love story! Great review! Hallo, Hallo! 🙂 Feels like half an age since I’ve been able to swing round and visit. In some ways it feels like a lot of time has transpired since late November overall. I have been seeing you on Twitter a few times, but I honestly wanted to return to your blog – you and I have the tendency to move in the same spectrum’s of literature – to where even if I am not reading the same author at the same time as you, their almost always on my TBR or ‘hmm, I wonder if I’d like them’ list of enquries! For instance, I haven’t yet had the pleasure of reading this author – I have been charmed by the premise of her stories and although I saw this one was releasing, I did wonder if I should begin with this one or perhaps, dig a bit further back and begin with a different title to have a better footing on the author’s personal style. From your review, I can tell, I should back-step a bit – I do agree with you; sometimes the style of the author’s narrative can work brilliantly in one title and feels a bit let-down in another. This has happened to me, too. The only difference we have here is I fell in love with the Roaring Twenties – I cannot pin directly when this happened, but I can mention a few turning points: “House of Elliott” which is a BBC tv series (short-lived, so sad!) set during an arc anchoured during the end of WWI and takes place in the drama of high fashion – this series has so much inside it, it’s pulsing with life. “Foyle’s War” another BBC tv series – set between both world wars became a dearly definitive series for me as well. However, when I read “Z: A Novel of Zelda Fitzgerald” I felt so dearly connected to Zelda herself, the whole of the era of the Twenties opened up for me. There are others in historical fiction who have captured my heart within the era – but I also understand if for whichever reason an era isn’t your cuppa of tea, too! I find myself disconnected by eras at times – I am still in need of researching Ancient Rome (for instance!) and other times, I just feel a bit ‘off’ or ‘out of step’ with a timeline. The Tudors can swing both ways for me – either I’m wicked happy for the visit or I feel bored or indifferent towards it overall. Quite strange how our minds alight in certain eras of time easier than others or feel more connected to certain instances of the historical past vs others which are more popular with others, too. It’s all personal preference and I applaud your openness to share your feelings and why sometimes an era isn’t working for you or even how the author’s style can draw a conflict in content. Many blessings to you, my friend. I apologise for my absences.